A meeting of the United Way of Addison County’s Community Impact Funding team. Hira Zeeshan ’22 is second from the left. 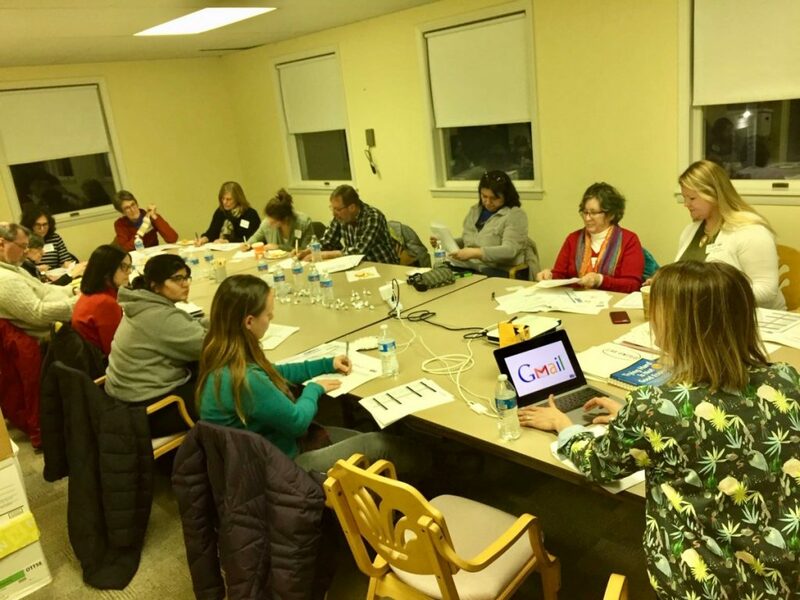 In January, the CCE advertised in our weekly newsletter an opportunity for students to join the United Way of Addison County’s Community Impact Funding Team. Since then, three college students, Lulu Zhou ’19, Hee Yeong Son ‘20.5, Hira Zeeshan ’22, have worked as part of the 27-member team. The students have helped allocate thousands of grant dollars, which will ultimately be distributed to 17 local nonprofit organizations. The grant dollars aim to support programs that improve the physical, mental, and emotional health of Addison County residents, such as hospice services, domestic abuse support, support for elderly, summer recreation, meal programs for local students, and more. According to the United Way of Addison County, in April, the team will convene to make funding recommendations to the UWAC Board of Directors, with the goal of focusing philanthropic dollars where they will make the largest impact. In the past three years, CIF grant reviewers helped UWAC invest over $990,000 in 33 programs covering 28 different agencies across the region. 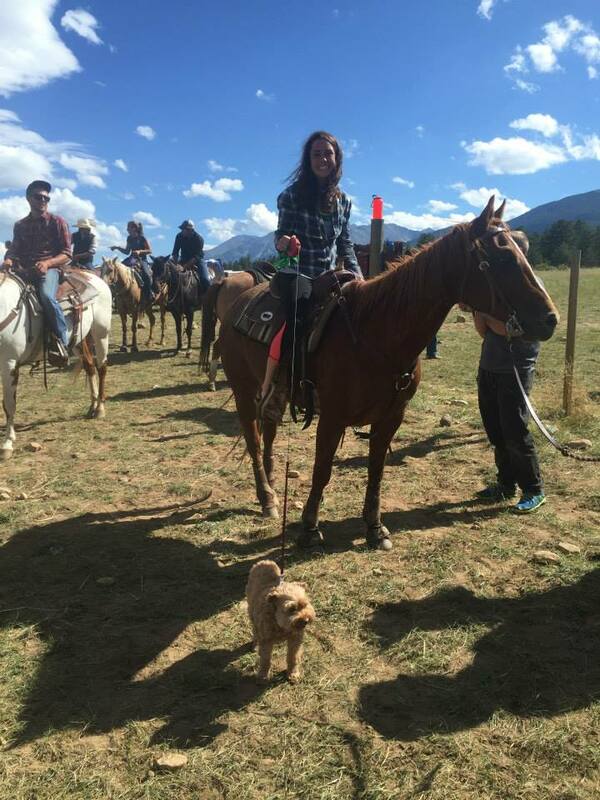 Student Lulu Zhou, who has been a member of the team for two years, called the experience one of the highlights of her community engagement and college experiences. This entry was posted in Midd Blogosphere and tagged News & Events, Student Leaders on March 22, 2019 by William DiGravio. This entry was posted in Midd Blogosphere and tagged Uncategorized on March 10, 2019 by William DiGravio. 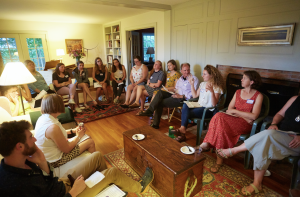 In the course of work done here at the CCE, students and staff members oftern partner with members of the greater Middlebury community and beyond. 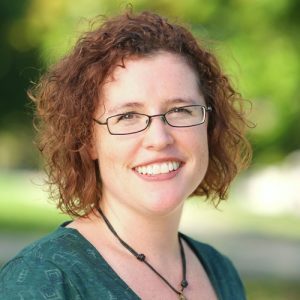 Below is an interview with one of one of our partners, Shawna Shapiro, associate professor of Writing & Rhetoric and the director of the college’s Writing and Rhetoric Program. Which CCE student organizations/programs do you partner with in your work? What kind of work do you do together? I’m the faculty sponsor for MiddROC, and have helped the group make connections to schools and other organizations in Chittenden County. I also talk through issues that come up in their work and advise on ways they can bring back to the campus in terms of knowledge and community-building. I’ve also done trainings with Juntos on English language pedagogy and other issues related to their work with migrant farmworkers. (I’ve also received AOE grants connected to my Intro to TESOL course- not sure if you want me to talk about that in this interview. Let me know, as that’s been where the community connections are a bit more involved). How have community connections impacted your teaching and research? Community connections offer a number of benefits: First, they help students complicate their understanding of “community.” When students say “Vermont is all white,” I can say “Actually, it’s not—you might want to check out these organizations that serve minority populations.” It also helps students see that the issues we talk about in class (e.g., language prejudice, English language policies in schools, etc.) have real-world consequences not just “out there” (in other places) but right here. Having community connections as case studies also helps students understand the messiness of organizational/societal change: Sometimes complicate political dynamics within an organization, or differing narratives about goals and histories, can be a barrier to movement. In those cases, our goal has to be to understand what’s happening, even if we can’t do much about it. For example, I’m currently working with teachers at Burlington High School to map out some curricular changes, but in our conversations, they’re starting to share more about all of the ways they’ve felt unheard and disrespected by school administration, which makes them leery to put a lot of effort into changes that once again might not be supported. It’s humbling for me to realize that my idealism comes from not having to deal with day-to-day struggles that teachers in this school are facing. What is one important thing you have learned either about yourself or the world around you during the course of your community-connected work? How does collaboration contribute to your work? Do you have any advice for those who may seek to collaborate on a project? Collaboration makes me aware of my privilege—not only as a straight, white, U.S.-born citizen, but also as a faculty member at Middlebury College. I didn’t realize until doing this sort of work that while Middlebury has a lot of prestige, many people in the community are skeptical of what scholars have to offer to real-world problems. I see my community engagement work in some ways as “PR” for the college. 2 pieces of advice: 1) Spend a lot of time learning about the issues—this can take months or even years. When you find yourself thinking: “This isn’t that hard! Why can’t they just…[insert naïve solution here] assume that there’s something you are not understanding about the history and/or nature of the issue(s) at hand. 2) Ask genuine questions. Acknowledge the deep expertise that community partners have, and present yourself as learning from them, rather than “helping” them. What is one of the fondest memories you have of collaborating with students in your work? In 2016, we used funds from an AOE grant connected to my FYS “Language and Social Justice” to visit Nepali heritage classes at the Vermont Hindu Temple (I had consulted with the leaders to develop the program and curriculum and to get some startup funding). When we got there, they had us all sit in a circle (Midd students, kids in the program, and teachers/helpers) and they taught us some letter in the alphabet. Then they asked me to remind students of why it is important for them to maintain a connection to their Nepali language and culture. At first I was taken aback, because I didn’t feel that it was my place to be making that argument, but one of the leaders said “You’re a professor. They’ll listen to you.” That was a moment where I realized that I could use my privilege to work WITH the teachers in reinforcing an important message to their young students. My students also visited an Open House for the Nepali Program later in the semester, and they had some great conversations with students in the program about all sorts of things. And there was delicious food and fun music! Know someone we should interview and/or spotlight? Email cceintern@middlebury.edu. This entry was posted in Midd Blogosphere and tagged Community Partners, faculty partner on January 24, 2019 by William DiGravio. The Privilege & Poverty Academic Cluster integrates rigorous academic study and focused direct service to disadvantaged communities and persons, enriching the education of undergraduate students in all majors and career paths. 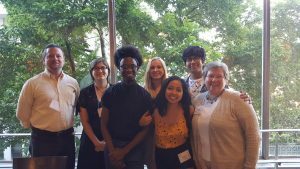 This summer internship program provides students with an opportunity to extend their learning about poverty and inequality in the classroom out into communities, both local and national, through funded summer internships. Local summer internships are available at WomenSafe, John Graham Housing & Services, HOPE (Helping Overcome Poverty’s Effects), Mary Johnson Children Center rural food programs and the Charter House Coalition . 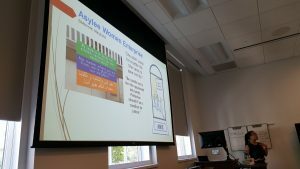 National internships are coordinated through our participation in the Shepherd Higher Education Consortium on Poverty summer internship program. 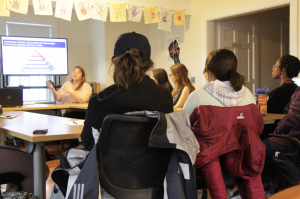 Since 2005, Middlebury College has participated in the SHECP program to support students in summer internships with agencies that seek to work alongside vulnerable populations. 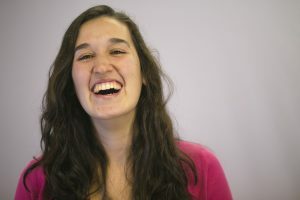 Internships are available to non-graduating Middlebury students and are located in urban and rural settings throughout the United States with agencies that serve in educational, healthcare, immigration, legal, housing, social and economic capacities for the needs of individuals and their communities. The deadline to apply is Tuesday, January 15th. To apply and learn more, check out the listing on Handshake. To get a glimpse into life as an intern, check out our photo story below. National P&P interns attend an opening and closing conference during the course of their internship through the college’s partnership with SHECP. Here, Elizabeth Zhou ’18 presents at the closing conference in 2017. Interns at the 2017 SHECP Opening Conference with CCE Director Tiffany Sargent ’79 and Professor and P&P Academic Director James Calvin Davis. The 2018 class of Local P&P interns gather for a group discussion during the summer. The 2018 class of local P&P interns goes through a workshop as they prepare to begin their internships. This entry was posted in Midd Blogosphere and tagged Uncategorized on January 10, 2019 by William DiGravio. This entry was posted in Midd Blogosphere and tagged Uncategorized on November 11, 2018 by William DiGravio. TODAY is Election Day and MiddVOTE is committed to helping you get to the polls! Come to ADK Circle to catch a shuttle to the polls every hour, starting at 8:00 a.m. and ending at 6:00 p.m. The shuttle will drive you to and from the Town Clerk’s office! More information can found on Facebook here. Students, faculty, staff, and local community members are invited to MiddVOTE’s #VoteTogether Party at the Polls! Stop by the tent at College Park (across from Shafer’s Market and Deli) to enjoy hot chocolate, pizza, face painting for children, and more on your way to the polls at the Town Clerk’s office and celebrate Election Day. More info can be found on Facebook here. As a Middlebury College student, you are a resident of Vermont! This means you can register AND vote in Middlebury on Election Day. Check out this article by The Middlebury Campus on how to do just that. And check out the paper’s coverage on elections here in the state of Vermont so you can be an informed voter! Come join us tonight from 7:00 p.m. to 10:00 p.m. for a bipartisan midterm elections viewing party at Crossroads Cafe! Help yourself to pizza, cookies, chips, salsa, and soda as election results come in. Professors Matt Dickinson and Bert Johnson will provide commentary. The even is cosponsored by the Middlebury College Democrats, Middlebury College Republicans, and MiddVote. More information can be found on Facebook here. Follow MiddVOTE on Facebook for updates throughout the day! This entry was posted in Midd Blogosphere and tagged News & Events on November 5, 2018 by William DiGravio. This entry was posted in Midd Blogosphere and tagged community partner profile, Uncategorized on October 3, 2018 by William DiGravio.